"A scary good run while it lasts." 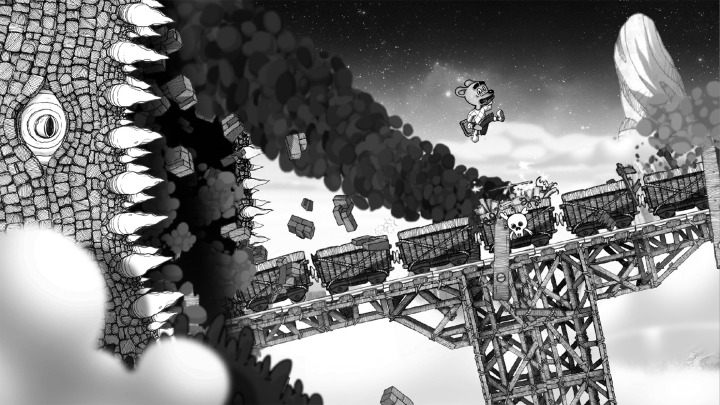 Wormster Dash is a side-scrolling auto-runner -- though not an infinite one -- which is actually quite finite. On a perfect run, you’ll beat the game in under five minutes. The catch of course, is that it takes some doing in order to have a perfect run; it's only possible once you've sacrificed scores of lives moving the screen forward bit by bit, eking out progress, learning the hard way what comes next. There are no levels, no saves, no checkpoints. Quick reflexes alone are not up to the task; progress is earned through experimentation, course correction, and memorization. A gigantic, malevolent, world-scouring monster worm is on the loose, tearing everything asunder. All you can do is run (and hop, and leap and melee certain obstacles), and run fast, so that you aren’t swept up into it, under its watchful eyes, into its gaping, cavernous mouth and under the malign influence of its infinite, relentlessly rending teeth. The trouble is, over distance, the worm is faster than you are. If you take the obvious route, you will eventually be overrun. The key to success then, is finding the shortcuts, which are marked with fast forward double-triangles. Once you find your first shortcut and see how much time you gain, how much breathing room it buys you, it will all make sense. But Wormster Dash, as small in scope as it is, is a tale of two games. The first part will have you fleeing breathlessly (your avatar, whether human or bipedal animal, will actually sweat under the strain) through industrial areas, over conveyor belts, onto a runaway train, while you seek out shortcuts to maintain your lead on the pursuing demon. One can't help but think back to monochromatic masterwork Limbo, as one runs life and death through this newer game's heinous, maim-ready obstacle course. But then you happen upon a cave in the shape of a sunken face (is it a safe haven, or the worm’s home? ), and once you enter its dark, otherworldly interior, there is a definite thematic and environmental shift for the game's unofficial second act. The interior is more about timing jumps perfectly over and around coiling alien mountains so as not to fall to instant death as you endeavour to close out your run. Again, the second half is less about staying ahead of danger (though the oscillating saw-teeth never stop coming, even here), and more about the danger wrought by a failure to manage precision platforming. There is not much to Wormster Dash; if I told you that the game was originally available for mobile devices, you would not be surprised. But despite its limitations, its developers have done well with the story that it has to tell. The visuals manifest a small effort borne out in sweetly animated, pencil-drawn black-and-white. The music is a suitably unnerving harbinger of impending doom; an appropriately anxiety-inducing theme of the worm's inexorable hunger. Despite its smallness, Wormster Dash is worthwhile. The tiny, terrible tale it offers is worth the harrowing single-sitting effort that it will take to learn its ways and prevent the end of your life and your world. If you enjoyed this Wormster Dash review, you're encouraged to discuss it with the author and with other members of the site's community. If you don't already have an HonestGamers account, you can sign up for one in a snap. Thank you for reading! Who needs six paragraphs? Me! And a dozen more, too! Not Marc! Good run of short to-the-point reviews on games not a lot of other people have bothered to look at. Team Indie make the world just a tiny bit better once again. Thanks, dude. I have another few short reviews planned to close out my alpha challenge. None of the material contained within this site may be reproduced in any conceivable fashion without permission from the author(s) of said material. This site is not sponsored or endorsed by Nintendo, Sega, Sony, Microsoft, or any other such party. Wormster Dash is a registered trademark of its copyright holder. This site makes no claim to Wormster Dash, its characters, screenshots, artwork, music, or any intellectual property contained within. Opinions expressed on this site do not necessarily represent the opinion of site staff or sponsors. Staff and freelance reviews are typically written based on time spent with a retail review copy or review key for the game that is provided by its publisher.